Antacids are useful in treating patient who suffer from gastro esophageal reflux disease. There are a few forms of antacids such as calcium carbonate, aluminum hydroxide, sodium bicarbonate and magnesium hydroxide. Each of them carries its own side effects, calcium carbonate may cause milk alkali syndrome, hypercalcemia, magnesium hydroxide may cause diarrhea, aluminum hydroxide may cause constipation and sodium bicarbonate may lead to metabolic alkalosis. Antacids will promote the healing process of the duodenal ulcers by increasing the synthesis of prostaglandin which will increase the mucosal barrier of the lining of the stomach. 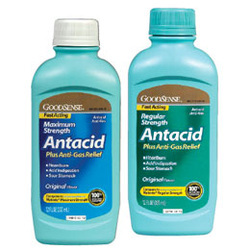 Antacids are known as weak bases which will react with gastric hydrochloric acid to produce water and salt. As a result there will be reduction in terms of the acidity of the contents of the stomach and raised in the pH. Antacid will indirectly lead to inactivation of the pepsin which will be inactive as the pH level become less acidic.